Confusion Mountain Range. Disappointment Hills. I couldn’t have named them better myself. Mule deer below Plympton Ridge. Tucked away in the northwest corner of Millard County, reaching northward into Juab County, this is not quite “The Middle of Nowhere.” After all, most people have actually heard of that notorious location. This area is more of a little-known and long-forgotten Corner of Nowhere, through which almost no one intentionally travels on their way to The Middle. Confusion (the state of mind) arises from the wrinkled and undulating topography of Confusion (the mountain range), combined with the often recurrent terrain. In the course of exploring almost every road and navigable trail within this area, I frequently found myself on a verified new route thinking “I’m just sure I’ve been here before!” Add to this the fact that the lesser-used interior trails (none would be properly labeled “popular”) frequently wind in and out of seasonal washes and regularly seem to disappear in the brush before you, only to reemerge several hundred yards away – and not necessarily straight ahead. While I can only guess that the range of hills comprising the northern end of the Confusions was dubbed “Disappointment” by a disillusioned prospector of yore, my reason for seconding this appellation rests on the doleful realization that 20-plus hours exploring this area on four separate visits revealed exactly four mustangs, all at least half a mile distant. But this is a huge area encompassing over 350 square miles – equivalent to all incorporated areas of the Salt Lake Valley, from SLC to Bluffdale – affording these wary nomads ample opportunity to be somewhere you ain’t at any given moment. But my disappointment pertains only to horse-spotting. Several unexpected sights and experiences more than balanced the scale, making my days in Confusion very well spent. Coyote Springs is a genuine oasis, its reedy green fingers fanning out across nearly 100 acres of Tule Valley white desert pan. The riddling of deep divots pocking the spring’s muddy perimeter indicates a surreptitious abundance of mustangs, pronghorns and mule deer. Piute ground squirrels scurry and chirp throughout the hills and canyons, attracting eagles, hawks, and even owls to the area. 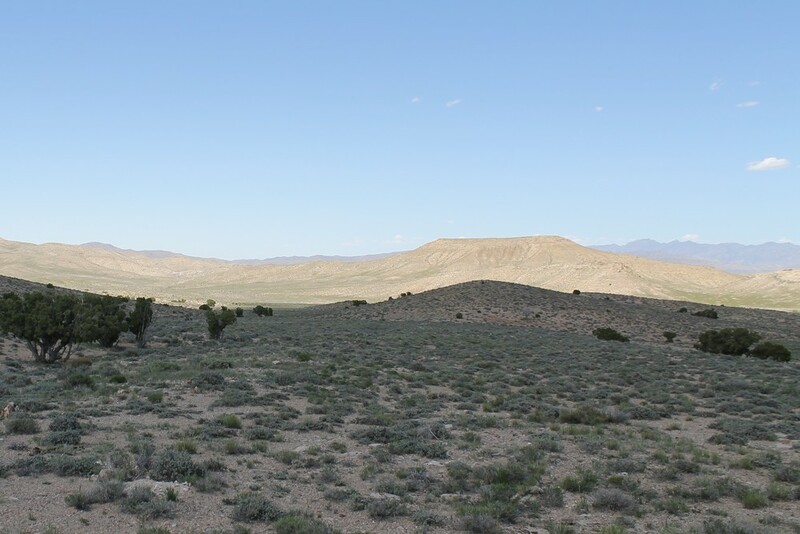 Top it all off with magnificent views of Swasey Mountain and Notch Peak, plus the inviting narrow washes, open valleys, rocky ridges and raised wedges of the interior, and this forsaken “corner of nowhere” turns out to be a “hidden somewhere” all its own. Strictly speaking, the Confusion Mountains stretch southward from Weiss Highway in west-central Juab County to include Conger and King Top beyond US 6 & 50. The Confusion HMA comprises the region lying north of Conger, from the Old 6 & 50 up into Juab County. This is a reasonable destination from Delta, UT, particularly in conjunction with Swasey (see the House Range Loop page for an itinerary joining Swasey, Conger and Confusion into an all-day trip). If you plan to explore the interior, or venture further north toward Fish Springs or the Onaqui HMA, you should top off your fuel in Baker, NV – the Border Inn includes gas and a convenience store, just over the Nevada state line on US 6 & 50. From Delta, the directions are the same as to Conger, about 70 miles west on either US 6 & 50 (paved) or the Old 6 & 50 (gravel). See the Conger Mountain HMA page for complete directions. From Baker, you can either take 6 & 50 east 16 miles to the Little Valley Rd turnoff, proceeding through Conger, or you can take a more direct route from the west along the Old 6 & 50. To access this route, turn left onto the gravel road toward Gandy about 0.7 mile east of the state line. Follow this road 12.1 miles. Watch for the BLM sign indicating the Old US 6 & 50 to the right. Pass through Robison Ranch and continue 13.8 miles to Foote Ranch Road, which runs along the west side of the Confusions, or continue through Cowboy Pass an additional 6.9 miles to Well 58 Road, the main thoroughfare through the Tule Valley side and the heart of this HMA. The BLM web page for this HMA suggests Foote Ranch Road or the foothills around Cowboy Pass. These seem like good suggestions, particularly for those just driving through in the family minivan. Well 58 Road is also an easy drive, providing a full view of the Tule Valley and access to the equally navigable road to Coyote Springs. To visit Coyote Springs, follow Well 58 Road 9.3 miles north from the Old 6 & 50. Turn right, as indicated by the BLM sign, and continue 9 miles east. You’ll know you’re there when the road loops back around upon itself before a broad bank of dense reeds. Begin with a left turn (west) about 2.2 miles north of the Old 6 & 50. Follow the trail into the wash and up into the canyon about 3.6 miles. The wash jogs south at this point, but veer west (right) onto the trail again immediately beyond the ridge to your right. Continue north 6.2 miles, where the road turns westward into a small canyon. This long, narrow valley between Plympton Ridge (east) and Chevron Ridge (west) is known as the Horseshoe (Little to the south and Big to the north). As you approach the canyon, note the intersection with a northbound road, as you will return to take this road a little later. 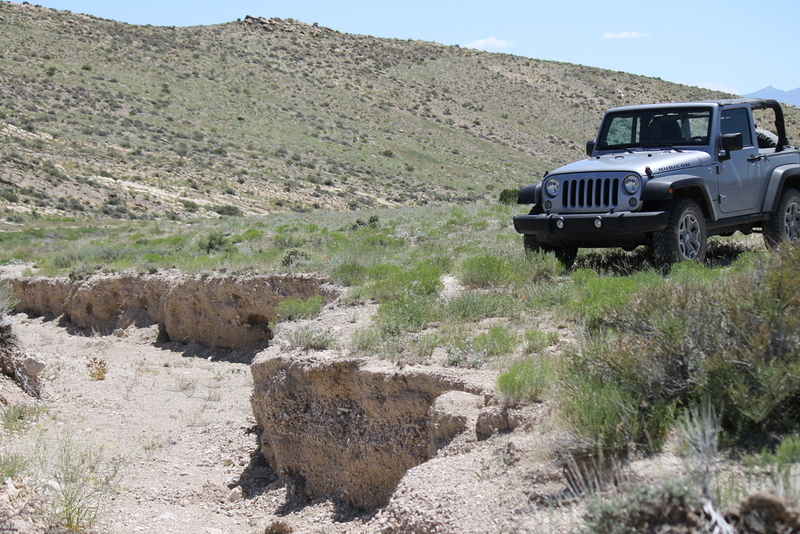 Continuing westward 0.5 mile through the canyon, notice the faint jeep trail to your left as you exit. This will be your return point on the route back to Checkpoint 4. Continue west 1.7 miles to an intersection with a north-south road. As this road turns eastward at its southern end, watch closely for the faint jeep trail branching off to the left just beyond the top of the knoll. Follow this trail 3.3 miles back to Checkpoint 5. Return 0.5 mile east through the canyon to Checkpoint 4. Now take the left branch north as it winds 2.9 miles through the remainder of the Big Horseshoe (veer left as you approach the old sign sticking out of an old barrel about a mile in). Merge onto the eastbound road, and continue 0.8 mile. Veer right, staying on the more defined trail for 1.2 miles. Turn right onto the more defined road, continuing 3.7 miles through the foothills. When the trail drops into a wash at this point, turn right and proceed down the wash rather than continuing up the other side. Watch for the trail to emerge on the right side about 0.2 mile later. Follow this trail 4.2 miles to return to Well 58 Road at the intersection with Coyote Springs Road. Baker, NV is the gateway to Great Basin National Park. Fish Springs National Wildlife Refuge, about 50 miles north of Coyote Springs is a huge oasis for migratory waterfowl. 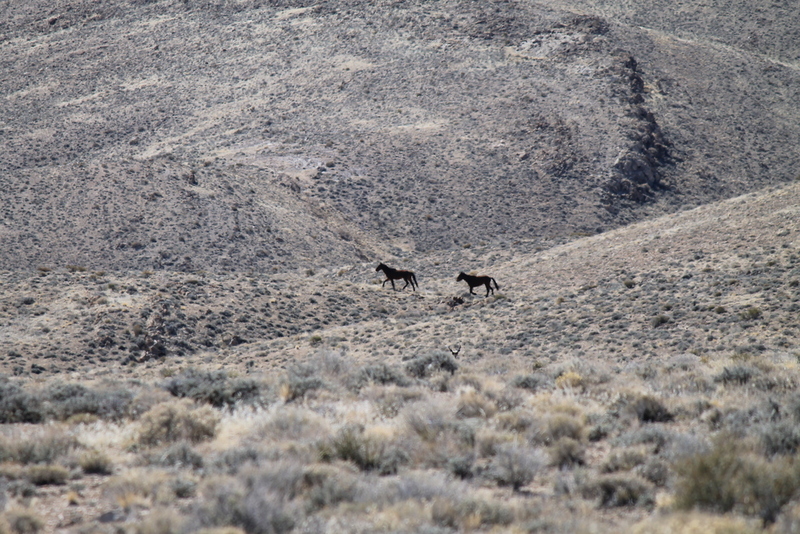 The Pony Express Trail proceeds eastward from Fish Springs, through the Onaqui Herd Management Area.